It worked well, the oneven loops. I made a strip of 60 loops, crocheted 20 rings of 3 loops each with 5 sc each, turned round the corners with 4 ch., the small loops were crocheted 2 loops at once with 1 sl.st., 1 ch. This makes a nice small border. 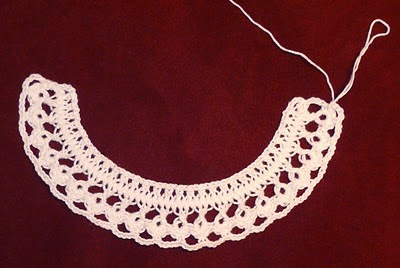 Introducing myself :) I am Hyke Groen and I have been knitting and crocheting for many, many years. I mostly design my own stitches and cables. I have 4 children and 3 grandchildren. I’m pretty sure I could fill a room with all the craft I’ve made over the years, but unfortunately not everything was photographed. I love to knit/crochet, while listening to the TV. I go crazy if my hands are idle, I even got a bamboo crochet needle, so I can work on the plane. When I’m not knitting or crocheting I also like to draw, paint, sew, photograph and write poetry (not necessarily in that order). On my blog I share my designs. Enjoy!